THE MERCEDES BENZ MUSEUM: Gottlieb Daimler (1834-1900) and Karl Benz (1844-1929), a pair of brilliant visionary Engineers, developed the first Motor Car and the first 'engine powered' Motorcycle in the 1880's. Claim to those two milestones within one country with both men working initially independently is not only amazing, it verges on the unbelievable when all over the then modern world horse drawn carriages and the like were considered the ultimate form of transport. The ground breaking 1880's achievements laid the foundations for a seemingly endless list of achievements, in 1926 the Daimler and Benz independent Companies formalised 'Daimler Benz AG', which to this day remains the overall parent Company to the instantly recognisable brand name Mercedes Benz. Apart from my interest in the first 'engine powered' Motorcycle, I freely admit I thought of the Mercedes Benz product as somewhat stayed, not exactly sporty. Deep breath time, studying the brand, purchasing my first Mercedes SLK350 and visiting the Mercedes Benz Museum in Stuttgart in 2009 and meeting Sir Stirling Moss, all these events continue to push my appreciation and learning curve of the the magnitude of achievements by Mercedes Benz both in their consumer products and competitive motor sport successes. Milestones, ground breaking achievements in both two and four wheeled forms of transport, no other Company can claim this heritage, the very birth of combustion engine powered transport. The 'clickable' image is the exposed right angle gear drive of the first 'Benz' three wheeled vehicle of 1886. The 540K says it all, finding this exhibit at the Museum just amazed me, the elegance of line, length, the dashboard features and finish, just amazing. The 'clickable' image is a close up of the Museum's 540K imposing front end. Possibly the largest indelibly linked display of Motor Vehicles at the Museum is the 'Silver Arrows' collection. A huge array of racing vehicles. The 'clickable' image is just a sample of 'Silver Arrows' collection. Some lineage here, starting with the SL190 this section covers some of the great cars on the way to the ultimate 2009 SLR McLAREN road car. 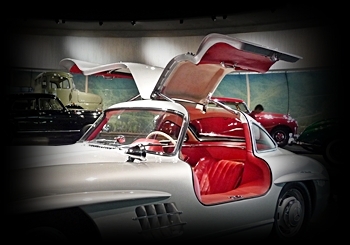 The 'clickable' image is the gorgeous SL300 Gullwing. If the various Concept Cars on display at the Museum are any guide then Mercedes Benz have a great future ahead, hybrids, open sports cars, all manner of vehicles were on show. The 'clickable' image depicts the nose of the Mercedes Benz F400 'Carving'. 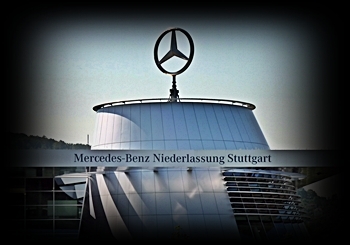 In May 2006 the Mercedes Benz Museum was opened in Stuttgart, Germany. The building is arranged in three overlapping circles and there is a particular reason for the circular design. Upon entering the Museum, visitors are whisked to the top of the massive Atrium by a very futuristic lift system, then a spiralling downhill walk entices visitors to view the history of Mercedes Benz. The 'clickable' image is part of the Museum with the famous three pointed star.